Direct Family Tree Maker Import is Here! Until today, the answer has always been through a GEDCOM file. But GEDCOM files from Family Tree Maker, while mostly effective, were often lacking data and details only found in the original file. Plus it added an extra step in the conversion process. That’s why we’re excited to announce today’s release of RootsMagic 7.1. In addition to various tweaks and fixes, this update adds the ability to directly import any Family Tree Maker file. In fact, RootsMagic can import a bigger variety of Family Tree Maker files than any single version of Family Tree Maker itself. You’ll first need to have the latest release of RootsMagic. If you’re using RootsMagic 7, simply choose Help > Check for Updates from the main menu to download and install the update. After the update is installed, select File > Import from the main menu. You’ll then see a list of different programs and formats from which you may import. Choose Family Tree Maker (FTM) from the list. Click Search for files to search your computer for all FTM files or I know where the file is to browse your computer and select the FTM database or backup file to import. Choose a filename, location, and options for your new RootsMagic file. Click OK to begin the import. Watch the progress screen as RootsMagic brings all your data into your new file! It’s Your Data- Set it Free! Most people are concerned about preserving and archiving their family history for future generations. With the constant advance of computer technology, computer software and operating systems are born and die everyday- sometimes leaving their data unreadable and with no way to advance it to current technology. This can happen with genealogy software and data as well- especially if they rely on proprietary or encrypted file formats. Your RootsMagic data are stored in SQLite database files. SQLite is the most widely deployed database engine in the world. It’s open-source and widely available meaning that other software can easily open and read your data. And because SQLite is so wide-spread, it is more likely to be readable for years to come. Your RootsMagic data are not encrypted. Family Tree Maker files are encrypted preventing anyone who doesn’t know the encryption key from being able to read or access the data. Directly importing Family Tree Maker files is the first step in our recently-announced working relationship with Ancestry. Stay tuned for the ability to search Ancestry’s trees and records and to download and synchronize them into your RootsMagic file. To help FTM users make the leap to RootsMagic, we’ve set-up a special website at www.FTMUpgrade.com that includes training videos, testimonials, and more. And for a limited time, we are offering Family Tree Maker users the full-version of RootsMagic for the amazing low price of only $20. If you choose the download option, we will also include the PDF book, “Getting the Most out of RootsMagic” absolutely free (a $14.95 value). You must visit www.FTMUpgrade.com to receive the discount. Works like a charm. All media imported fine. Bruce & Michael! Job well done! I just did an import of my 17,200 people, over 900 sources and almost 20,000 citations. Most events had long description summaries too, besides huge notes for transcripitons, proof summaries, etc. It did it! RM7.1 imported the FTM 2014 file in it’s exact form. No problems with my media either. My notes. Oh my gosh! This is the VERY FIRST TIME I’ve seen no problems with them when switching software. They literally look copy/pasted. This is the very first time that I’ve not had my notes not have word spacing problems. Viz, extra spaces between words/no space between words/spaces in the middle of words. All software has created those. Even RM importing a Legacy file. Always messed up. NOT this time though! I’m one happy camper here! I just can’t pat your backs nor praise you enough. AS I said, job well done fellas. The only thing I see that will be a little work, is getting my sources themselves corrected (formatted in ESM form), but otherwise, I see NO other work needing done. Fantastic. THIS is the way things ought to be done between ALL software. Gedcom, bah. Throw it out. I had stated on the FTM board on Ancestry (a few days ago) that RM would be able to do it fully, import the actual FTM file and it remain in it’s original form and you’ve just now proven it. Others didn’t believe me. But I knew you could & would do it! Many, many thanks and here’s “2 thumbs up” and another *pat on the back*. 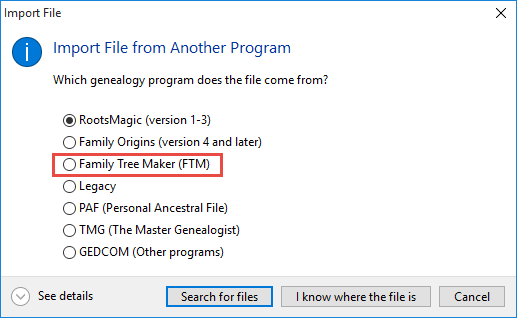 As a longstanding family researcher with very limited computer skills, I have managed to download the program this evening and imported my file directly from Family Tree Maker 14,with everything in order, including the media.I chose this program as I read that it is user friendly. [I am of the older age group]and with good support.I am trying to get the icon on the computer and trying to learn Dropbox.Thank you so much. I am thoroughly impressed! I just transferred my family records from the 1st version of Family Tree Maker I’ve used for years & was astounded how easily & quickly everything transferred without a hitch! I was never quite used to FTM as I found it a bit difficult to navigate, especially when I was several generations back adding information & got lost trying to get return via the confusing tabs to more present family members like me! Your “tree” setup on the main page is terrific in seeing relationships 4-5 generations back without trying to figure out from the file tabs I was used to seeing on FTM where I needed to go next. I was leery about possibly losing the 450 or so family member & all the notes, scanned documents & photos, etc., doing the FTM to RM file transfer but it all worked great! Many, many thanks on having a 1st class genealogy program that’s easy to follow & use. That went exceptionally well All my Family Trees transferred from FTM to Roots & no problems. There is so much to learn especially with the nuances of a new program. This is something I decided to do, I ordered the download of the book, Getting the Most Out of Roots Magic, by Bruce Buzbee. It’s on the home page under products. It has helped me so… much, I have actually printed it off. It is now so full of sticky notes and tabs to the areas I need to work on the most. The more I work with Roots Magic the more I really enjoy it. Thank You Roots Magic for making things so easy for all of us long time users of FTM. Very happy I made the switch. I have been using Roots Magic for a couple of years now. This is, truly, the best software I have found. The continual updates are wonderful and important to serious family historians and genealogists. Believe me, I have done my homework on other products, and this software is far better than other products available on the market, I applaud the software designers for their continual attention to better this product, and I urge serious researchers who need a complete yet simple home for their data to invest in Roots Magic. I’ve purchased a copy of Rootsmagic and have done I sample import of my FTM data and it looks promising. I’ve really enjoyed the TreeSync feature in FTM and I see you’ll have something similar. I do research on a Desktop PC, Laptop PC and a tablet. One thing that always bothered me about FTM without doing manual copying, i can’t keep my 2 install copies (Laptop and Desktop) in sync. I’ve always had to have a master on my laptop and make edits in my Ancestry tree on the other devices if i wanted them to sync. If there was a way to sync across multiple devices it would be great. I have 7 siblings and this would work great for sharing updates. I currently can only invite them to my ancestry tree. Ideas? I have been using Family Tree Maker since Version 1.1 in 1989, back in the days when the DOS based program allowed only 1,200 names in each file. Through the years I upgraded and upgraded, finally to Family Tree Maker 2014. Now with 41,598 names, 202,500 sources, 3,800 images and growing, the time has come to part ways. I was amazed this morning to find out that a program exists that imports my database directly, no Gedcom involved. Right now it is making the 3,800 media thumbnails, and that is going to take hours, but the import itself last maybe ten minutes. Timw will tell how well this all works. I still had 4,040 unlinked sources in Family Tree Maker, those dating back from much earlier software versions. I will be interesting to see how Roots Magic handles these. That is one thing I do not yet know. Keep up the good work, and given the shameful way ancestry.com treated short and long time (25 years for me) users, I am glad to see another option out there.